True & Dorin Medical Group was at the forefront of the development of follicular unit extraction (FUE). During this hair restoration surgery, our surgeons gather follicular units, or groups of one to four follicles, directly from a donor site where a patient’s hair grows thickly. These units are then transferred to areas where baldness or thinning occurs. FUE has some unique risks that patients should be well aware of before deciding whether this restorative technique is right for them. Drs. Robert True and Robert Dorin are exceptionally skilled in FUE and can help you determine if this surgery is right for you during a consultation. To learn more about FUE risks, contact our New York office today. FUE is one of the most trusted and popular hair restoration procedures today. It is less invasive than some other techniques, including follicular unit transfer (FUT), while still providing excellent, natural-looking results. The FUE treatment begins when Drs. True or Dorin extract individual follicular units using a specialized tool. These units grow naturally together in a pattern on your scalp, so they look most natural when transplanted in groups. This harvesting process is what separates FUE and FUT. In FUT treatment, a strip of a patient’s scalp is first excised from the back of the head. Follicular units are then extracted from this strip, rather than directly from the scalp as in FUE. 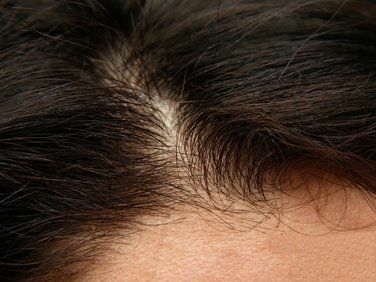 Once follicular units have been extracted from the donor area of the scalp, they are transplanted as groups of hair into areas of the scalp that are balding or thinning. This is done in a precise, controlled manner that best creates an aesthetically pleasing appearance. Patients should consider all of their restorative options before deciding on surgery. Other treatments, like laser therapy, topical solutions, and oral medications can have great results for some patients. These nonsurgical treatments have fewer risks than treatments like FUE, which should always be considered before determining which hair transplantation process is right for you. There are common risks associated with all types of surgery. Possible complications include infection, excess bleeding, unsatisfactory results, and pain. Our highly skilled team is trained to recognize and address any of these potential issues as they arise. FUE carries some unique risks. The most common are the risk of follicle damage, as each follicular unit is directly extracted from the scalp. When a follicle is damaged, it is unlikely to produce hair when inserted within the scalp. Patients also run the risk of an uneven or patchy hairline after transplantation. This already low risk of complications is further reduced by selecting a surgeon with unparalleled skill, like those at our practice. While risks do exist, the beauty of the FUE procedure is that it was designed to be less invasive than surgical techniques of the past. While some risks must be considered, the large majority of FUE recipients are extremely satisfied and confident with their final results. To learn more about our hair restoration techniques, including FUE, please contact us today. We can help you understand which treatment is best for you during a consultation.